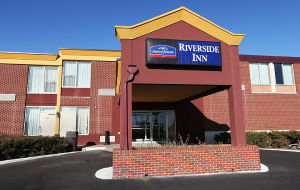 About 20 rooms at the Howard Johnson Riverside Inn have been shut down by the Grand Island Fire Department. The 182-room hotel and convention center at 3333 Ramada Road that received $100,000 in tax dollars for redevelopment two years ago has no fire sprinklers and until recently had stationary windows that could not be opened to escape a fire. While most rooms have been upgraded with opening windows in the past few months, 20 rooms on the second floor still have windows that do not open. “Rooms with no secondary egress from the unit are not to be used and are to be ‘signed,’” Fire Marshal Fred Hotz wrote in a Feb. 14 letter to hotel owner Chuyen Ngo. Hotz, who serves as life safety division chief for the Fire Department, ordered the hotel finish installing egress windows on all the rooms by May 1 and add a sprinkler system in the convention center area by May 31. By July 30, the entire hotel property is to have either fire sprinklers or firewalls in place. “All uses within the entire building will be ordered to desist” if the life safety improvements go undone, Hotz wrote. Knuth said the hotel was built in 1971 and, as far as she knows, was constructed with the non-opening windows and no fire sprinklers. City building officials aren’t so sure and believe the stationary windows may have been installed after the 1980 tornadoes destroyed many South Locust businesses. There was so much construction going on at the time, inspections didn’t always get done. The hotel has fire alarms that are tested monthly and fire extinguishers in hallways, Knuth said. Last year, Ngo paid to upgrade most of the windows, but the second-floor windows facing Locust Street were left unchanged because he was considering altering the convention center and eliminating the sleeping rooms in that area, Knuth said. Now the plan is simply to get those rooms back on the rental market. “We need the rooms. We’re booked up for (Nebraska State) Fire School,” Knuth said of the May 16-18 event that brings firefighters from across the state for training at Fonner Park. The life safety issues in the hotel came to light after the Community Redevelopment Authority awarded the hotel a $100,000 facade grant in January 2012, CRA Director Chad Nabity said. That grant and $524,000 of tax-increment financing were to be used toward an overall $1.4 million upgrade of the hotel, including the development of a 150-seat Denny’s Restaurant, which has since opened. Nabity said the CRA was unaware of the life safety issues when it approved its financial assistance. It hadn’t even occurred to the CRA members to check about life safety issues because the hotel had been, and was, in daily operation. As the renovation progressed, the hotel’s previous whole-property liquor license ceased and Denny’s applied for a liquor license that applied only to its restaurant and the End Zone Sports Bar, which it also operates. The city then began to get special designated liquor license requests from caterers serving at wedding receptions and conferences at the convention center. Building Department Director Craig Lewis, whose department gets inspection notices for all liquor license permits, said after receiving nine special liquor license requests in five months for the Howard Johnson, it was apparent a permanent license would be needed. The previous permanent liquor license had carried with it a grandfather clause for some of the life safety issues, he said. Full Circle Venue owner Misti Williams applied for the permanent liquor license, which brought forth more concerns about the life safety issues at the hotel since they were no longer grandfathered in. Lewis and the Fire Department recommended that Williams could have a permanent liquor license in the convention center, but only if she had a “fire watch” in place. “A fire watch is somebody in reasonable charge whose function is to control the crowds and watch out to make sure something bad doesn’t happen,” Lewis said. Williams is to have one fire watch for a crowd of 100, two fire watches for a crowd of 200 and three for a crowd of 300. The Grand Island City Council approved those conditions on the liquor license application at its March 11 meeting. The request now goes to the Nebraska Liquor Control Commission for final approval. Knuth said most wedding receptions have about 250 to 300 people, but if the convention center is set up in chairs only, the capacity is 750. The restaurant and lounge together have a capacity of 328, she said. Those spaces, plus all of the hotel rooms, had all been in use up until earlier this year, when Hotz conducted an inspection. “We’ve never had an issue,” Knuth said. But for a permanent fix, fire sprinklers are needed. Webb Architects is developing the fire sprinkler plan, she said. The CRA recently approved funding for life safety improvements to a downtown building — Tower 217, the seven-story former Masonic Temple. Nabity said while the Howard Johnson could apply for additional CRA funds for the fire sprinkler system, he wouldn’t recommend it. The CRA is “thrilled to help” with projects that follow its core mission of reducing blight in the community, but owners are a partner in that, too, he said. “We’re part of the solution. We’re not the sole source,” Nabity said. Knuth said Ngo understands the improvements that need to be made and the timeline the Fire Department has set out. “If they’re telling us it’s got to be done, it’s got to be done — for the safety of our guests and anyone entering the hotel really,” she said. Follow Tracy on Twitter or find her on Facebook and Google Plus.